It is said that Purim will be the only holiday that we’ll celebrate after the final redemption, but if all the holidays are based on cosmic windows, what separates Purim in the grand scheme of cosmic time? We read about Purim in the Book of Ester so that’s where we must search for the answer. Unless, the events of Purim as laid out in the Megilat Ester were to reoccur today, at least metaphorically and spiritually. What if these events that occurred at the end of the 70 years of Babylonian exile were to repeat themselves at the end of the 70 years of our present exile? Yes, this current exile has lasted 1948 years since 70 CE, but only 70 years since the establishment of Israel as a nation in 1948 CE. 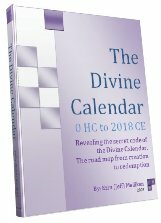 Of course the final 70 year time span is based on Rav Yehuda Halevi Ashlog (HaSulam), and other well established predictions of the coming of Mashiach and the final redemption in 5778 (2018 ce), but we’ve covered that in a hundred other articles and books like The Divine Calendar and There’s Nothing Random About the Universe already. That would indeed give us a reason to keep celebrating Purim; it would be celebrated as the final revelation of the concealed light. It would also mean that we actually have a blueprint of events that are to unfold in the final 8 years. Every bit of the Tanakh is encoded, and we spend most of articles helping decode the first 5 Books of it, the Torah, but the Megilat Ester (The Book of Ester) is one of the most thoroughly encoded ones, with so many concealed Names of G-d, names of sefirot (the 10 dimensions) etc that it must surely hold some clues for us, something pointing to today. Let’s look at the special sequence near the end of the reading of the 10 chapters of Ester, where the reader must recite the 10 names of the evil Haman’s children that are killed, in a single breath. It occurs in 3 symmetrical sequential verses of the 32 verses in Chapter 9. The number 32 always hints to hidden Tanakh wisdom, as it references the 32 Paths of Wisdom that comprise the structure of the Tree-of-Life and the number 9 also references wisdom as the 9th sefira (dimension) of that Tree is the sefira of Chochma (Wisdom). That said, we know these deaths represent the removal of evil (klippot) and Amelak (doubt) from the 10 sefirot. And as we mentioned in a pervious article, it was in the 70th verse of the Torah that G-d punished the snake and told him that he’ll eat dust for all the days in his life, meaning that his life was finite. Perhaps the snake’s demise will be found at 70 years. It was after all after 70 years of Abraham’s life that G-d made his Covenant with him in 2018 (HC), which is analogous to 2018 CE (5778 HC). When the snake (NChSh) dies, Moshiach will live, as they both share the same gematria, 358. And thus we can see how the 42-Letter Name (Ana B’koach) is integrally connected to this verse, and the prophecies that through its’ understanding will come the geula (final redemption) in 5777-5778. And as it just so happens, 73.1415778 = 2 x 36.5708 and 5708 is the year Israel became a nation, 70 years before 5778, fulfilling the 70-year period proscribed by the Zohar. 70 years is a very significant period in Biblical history (as explained in The Divine Calendar) but it’s in the 70th chapter of the Torah that the 10 Commandments (Utterances) were given in 2448, when we last stood at the threshold of the Tree-of-Life reality, 66.6 jubilee years ago. But back to the Megilat Ester, in this section of the 10 sons, the word v’et (VET) precedes each of the 10 names. VET is the 4th word in the Torah and has the numerical value 407, whose square root just happens to be 20.17424, or if we were to apply Number Theory and break it up, we’d have possibly the year 2017 and 424, the numerical value of Moshiach Ben David. So in the reading of the story, this connection is made 10 times, once for each of the 10 sefirot (dimensions) connected within in a single breath. Interestingly enough, the Hebrew word for letter or sign, Ot (EVT), is found exactly 10 times in the entire Torah, and 22 times in the entire Tanakh, corresponding to the 22 letters in the Hebrew Alef-bet. We know from the sages that the last letters of phrases in Tanakh point to the future, and so when we find that the sum of the 10 names in the 11 words conjoined by the articles VET equals 376, the numerical value for Peace (Shalom), we can take heart. And that the 11th is Alef is quite significant for a new beginning as well. The first letters also reveal important encoding and information for us. In this case, we start with the alef from the word (EYSh) that precedes the first VET and is an integral part of the 10-sefirot listed sequence in the Book. The collective first letters sum to 256, the numerical value of Devarim (Deuteronomy), the last Book of the Torah and also of the Name Aaron, Moses’ brother and High Priest, and the only person associated with the written word Moshiach in the Torah. And while 256 = 28 or 44, interestingly enough, the first 8 of those letters, add up to 248, the numerical value of the Book Bamidbar (Numbers), and of Abraham. 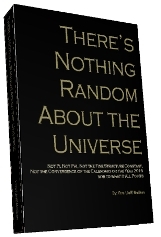 Be that as it may, we’ve discussed in prior articles that the Torah is constructed of exactly (600,000 – 408) component letters and that 408 times the letter vav of numerical value 6 equals 2448, the year of the exile from Egypt and the reception of the Torah at Sinai when we all last had the opportunity to receive the Tree-of-Life, 66.6 jubilee years ago. And since the Tikunei Zohar tells us that each brush stroke of a letter is equivalent to a letter vav (6) we can see why multiplying the missing 408 by 6 is so valid. As an aside we can see why the 7 collective strokes on the 2 differing letter Shins (Sh) embossed on the tefillin add up (7 x 6) to 42, as in the 42 Tetragrammatons (YHVH) within the tefillin, and as in the 42-Letter Name of G-d that preceded Creation. And so, it’s surely no coincidence that the final 3 letters of the single breath passage in discussion (TzTE) add up to 408, or that the word they come from (VYTzTE) has the numerical value 424, that of Moshiach Ben David. So this passage begins with Truth (Emet), a kabalistic synonym for both Torah and the 42-Letter Name of G-d that begins with Elef, ends with Tav and has 40 (M) letters in between. Then the passage proceeds through 54 letters and ends with Moshiach Ben David. The 54 letters are significant because the 9 brush strokes in the Tetragrammaton (YHVH) at a value of 6 each add up numerically to 54, representative of the running and returning Light though the 27 letters. They also hint to 5778 in that the sum of all the positive integers through 107 = 5778 while 54 x 107 is also equal to 5778, but be that as it may, the sum of the 12 words and names in the passage (excluding the 10 VET’s) is 5805, or 5778 plus 27, representing the 27 letters of the complete Alef-bet. 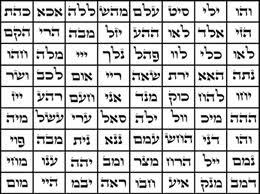 And kabbalistically, all 27 letters are found bound up in the single letter Alef (E), the seed of the entire alef-bet, thus referring back to the “1 letter” to complete the Torah in the days of Moshiach. The 3 verses (Ester 9:7-9) are symmetrical, a rare occurrence in Tanakh, further distinguishing them: the first letter of each is Vav; the first letter of the 2nd word in each s Pe; the first letter of the next word in each is Vav again; then D-E-E; then the first letter of the 5th word in each is Vav again; and then the first letter of the 6th word in each is Alef(E). So the symmetrical Vavs add up to 9 and once again 9 x 6 = 54, which leaves the symmetrical PE, which can either spell the letter Pe itself, or stand for Petach Eliahu (PTCh ELYHV), “opening Elijah” or “opening to G-d (YHV)”, whose numerical value is 540 or 54 x 10, and when the kolel of 1 is added, it’s 541, the numerical value of Israel. In the Torah everything has a special purpose. There are 10 large letters in the Torah, connecting us to Binah (the upper world); 6 small letters, connecting us to Zeir Anpin of malchut of Zeir Anpin (the final channel into our lives); there are 10 places with 32 dots, connecting us to the 32 Paths of Wisdom that connect the 10 Sefirot and that according to Rabbi Chaim Vital of blessed memory make up the 42-letter Name; and there are 6 letters at the top of the column that are not vavs (V) and thus do not connect to Zeir Anpin like the rest of the Torah, and instead they connect us to H’Mashiach, the Messiah, of the same numerical value. All together there are 10 + 6+ 32 + 6, or 54 special letters in the Torah. Moreover, with the 10 VETs in (Ester 9:7-9), we have 30 + 54 = 84 letters, the numerical value of the Hebrew word Pad, meaning “redemption,” and as explained by the tzaddikim, this is the fusion (42+42) of the upper and lower 42-Letter Names, the understanding of which they say will bring about the geula, the final redemption. Pad (PD) is also the initials (Pe and Dalet)of the first two of Haman’s sons listed. It’s all about the Tree-of-Life. 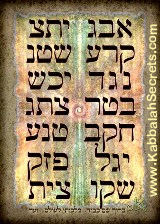 The 10 VETS, all connecting to Moshiach Ben David (424) manifestation in 2017, represent the 10 Sefirot, and the 22 words in the passage represent the 22 pathways between them, completing the 32 Paths of Wisdom. And the 84 letters + 22 words + 1 breath of G-d totals 107, so as hinted by the tzaddikim and the encoding in the Book of Ester, if we align our consciousness to remove the negativity from ourselves and our world throughout the 10 sefirot, this embedded technology will serve to bring about the final redemption, which is all the more reason that Purim will be the only holiday that we’ll be celebrating in the near future. And if we add the names of the 5 principle characters in the Book of Ester–Ester,(ESTR) Ahasverosh(EChShVRVSh),. Mordechai(MRDCY), Daniel(DNYEL)and Haman,(HMN)–the 22 letters in their combined names add up to 1946 and since the Zohar describes a final 72 year period before the final redemption, we once again arrive at the year 2018 CE, or 5778 HC. The real answer to the question why Purim will be the only holiday (Chag) after the final redemption is that according to the Zohar and Rav Ashlag’s commentary, portion Ki Tisa (11:95) the word Chag (feast, holiday) is derived from the Aramaic Chaga, meaning breaking, that is “to execue judgement upon you,” and since the cosmic holidays were all desigend to mitigate the judgements upon us, they will no longer be necessary once we’ve achieved the Tree-of-life consciousness and live without judgment. Purim is designed, not to help us with our world (Malchut) ruled by time, but to help us navigate the universe beyond time, beyond the appointed time, the Tree-of Life.